Creepy evil guinea pigs... I looked at this pic Mike took and shuddered, they look eeeeevil! Wee beady glowing eyes, ready to EAT YOU! Creepy... i will be having nightmares for the rest of the week. Thanks. bwahahahaa!! 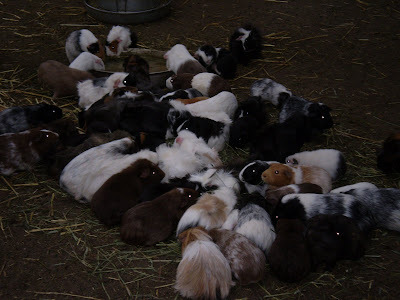 I love guinea pigs. That little wierd sound they make, and their messed up hair.